Congratulations to YEWTHS ROC on receiving the business award from the Montana Council for Exceptional Children based out of Missoula, MT. The award "recognizes a business or corporation that has provided for the employment and enhancement of individuals with exceptionalities in order to promote and support their full participation in the community" (MCEC 2016). A huge thank you to the school teachers that have participated in the YEWTHS ROC program and nominated us for this great award. We believe that by showing children around the world how they can use their gifts and talents, they can begin to change the world for the better. Here at ROC Wheels, one of our main outreach programs is our inmate wheelchair building program. While partnering with Hope Haven International Ministries, we have been able to employ over 10 inmates to help build our newest wheelchair, the ROCKIT. The team lead of production at the prison is Denny Tew who has been helping build wheelchairs for ROC since 2003. He has been instrumental in building a team that helped build over 3,700 of the original ROC chairs and now build ROCKIT chairs and assembly kits to be used by YEWTHS ROC. We would like to thank Tew for his service to our organization and his dedication to our mission. Tew has left South Dakota State Penitentiary but was kind enough to gather the following testimonials from the inmates. 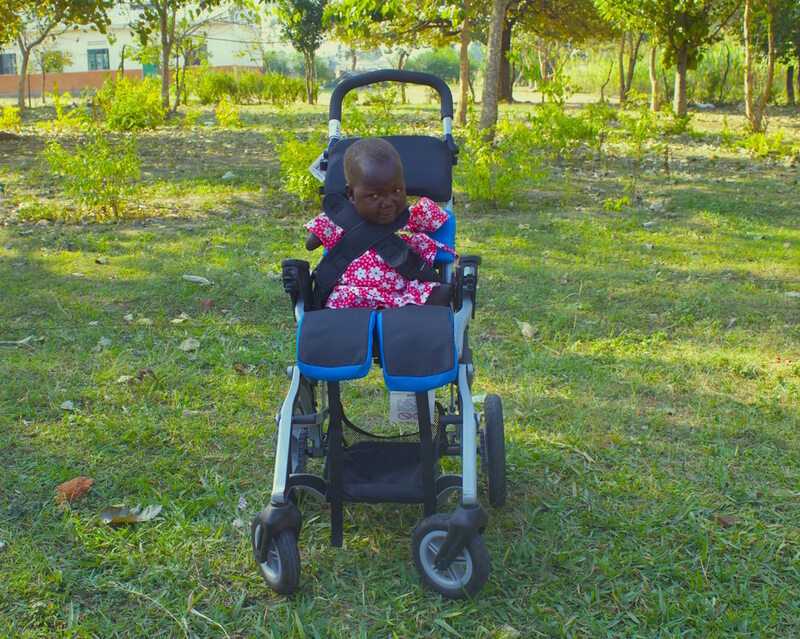 On December 22, 2015, ROC Wheels received word that, Gift, a four year old living in South Sudan received delivery of her brand new REACH wheelchair. Several months earlier in September, we were contacted by Jeanie Tidwell who has been serving as a short term missionary in South Sudan for the past 8 years. Jeanie told us the story of Gift and how she had been born with an extremely rare syndrome called Tetra Amelia (only 7 known cases in the world today) which causes the child to be born without arms and legs. Many told the mother of Gift, Jerissa, that she should starve the baby because of these complications but she chose to keep her. Wayne Hanson, our co-founder, was able to modify our current reach chair so that Gift would stay secure and properly supported in her new chair. Leggero, a wheelchair manufacturer, based out of Bozeman, MT also generously donated their time and resources to make sure that the wheelchair included important support features. Thanks to Jeanie and her donors, Gift is now more mobile than she has ever been. Gift's mother stated that she is now relived from the pressure of leaving her daughter with children who were tired of carrying the child from one place to another. Gift is now able to be easily moved from one place to another by wheelchair. Life in South Sudan is extremely hard for a child that is healthy and without handicaps, but it will be even more difficult for Gift. One of the reasons I felt she needed a "special ride" was so that she could more easily go to school. Her parents also expressed concern for finances to educate her. At this time in South Sudan many can only afford to eat one meal each day, some cannot even eat everyday. Many have to make the decision to feed or educate their children and of course from necessity they do their best to simply feed them. I would ask for prayer for all children in South Sudan to have food to eat and an opportunity to have an education, even for special education as will be required for Gift. We have just completed the design and development of the new ROCKIT Wheelchair. The ROCKIT is a highly adaptive wheelchair that serves children with even the most severe disability. We need help in raising funds to purchase the tooling needed to distribute ROCKIT Chairs world-wide. People in less resourced countries will be able to get a fully assembled ROCKIT Chair or a ROC Kit which includes all of the parts and pieces for the ROCKIT Chair. The ROC Kit includes the information and instructions people need to build their own wheelchairs. Essential tools, instructions, and an educational curriculum are provided to help them give continuing care for the child and family and help put people to work in their community. Over 5,000,000 children with severe disabilities in less resourced countries need the ROCKIT Chair. Children with disabilities are often hidden, helpless, and out of sight. These children either have no wheelchair or are in a basic wheelchair that does not offer the critical support and comfort they need. A similar wheelchair to the ROCKIT would cost $4000 - $5000 in the US. Once we purchase the necessary equipment and tooling we will be able to make ROCKIT Chairs for less than $200. The ROCKIT Chair has been recognized as a world class solution for these children by numerous organizations who would like to distribute it to the countries they serve. There has also been a great interest in building ROCKIT Chairs at a number of prisons in the US. The ROCKIT Chair has taken two years and thousands of man hours to complete. Rigorous testing has been done and numerous people have provided valuable support, including engineering interns, volunteers, students, and service organizations. These people have gained valuable skills, insight on disability awareness, and have been mentored by highly qualified professionals. Currently, inmates at South Dakota Department of Corrections are building the ROCKIT Chair. They learn new skills and have an opportunity to make a big difference in children’s lives. Inmates build ROC Kits which are assembled by children and young adults in the YEWTHS ROC program. The YEWTHS ROC program is designed to empower youth to reach out and care for others, both in their daily lives and in other parts of the world. Building ROCKIT Chairs is a key part of the YEWTHS ROC curriculum. We hope you will be able to work together with us to support this project. We would not be here without your personal and financial support. We have included some links which illustrate more about the ROCKIT Chair, who we serve, and how we can accomplish great things through the ‘Power of Partnering’. We need business to partner with us by matching donations for kids in the local schools. Through the YEWTH ROC program, the school children learn about social entrepreneurship and technology by building wheelchairs. This empowers them to reach out and care. If you are interested in partnering with us, email us at info@rocwheels.org. We are looking for new mentors to be trained to build our new ROCKIT chairs. After training you will assist students with building the chairs in group projects. We need committed individuals that are available in the daytime. To volunteer, fill out the form here. Andrew Kaltenbach is studying mechanical engineering at Montana State University. Andrew spent the summer as an intern for ROC Wheels. 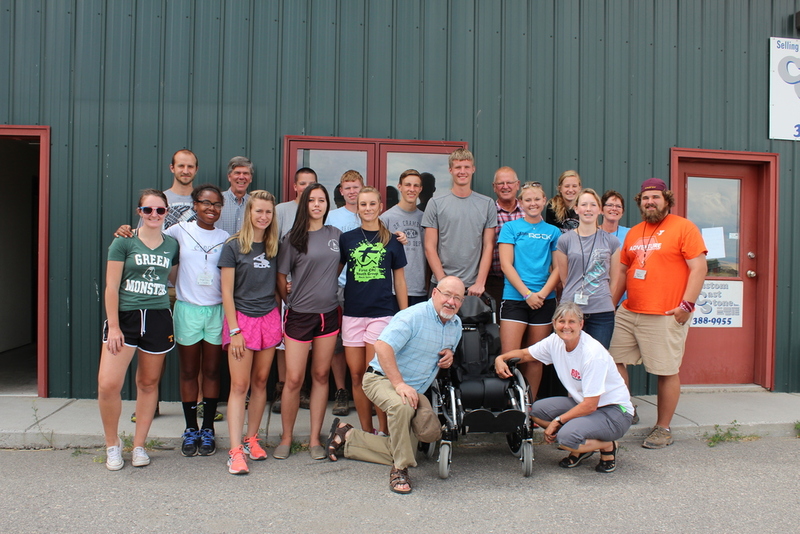 During one week in July, YEWTHS ROC hosted students from across the US and Canada to build 4 chairs. The group was part of Gallatin Valley Serve which sent groups out to multiple sites to engage in serving the community. Each day a new team came to build a chair. We introduced ourselves and described what YEWTHS ROC does. We showed some videos of previous distributions that detailed what a great impact the gift of mobility can make in the lives of children and their caregivers. With that inspiration we started building! These youth participated in building one of the first ROCKIT chairs. This latest design is built for rough terrain in developing nations and is able to fold compactly. It was great for the design team to get input from the youth as the prototype came together. We were blessed by all their hard work and their willingness to serve. On August 31st, we had our core group of volunteers do a training build on the new Rockit chair. This was extremely beneficial for the design team to receive input on any changes that needed to be made before we bring our mobile manufacturing unit into the classroom. We are blessed to have a dedicated group of volunteers that are willing to commit their time to becoming very familiar with this pediatric chair. They are critical in ensuring we can get the youth in the Gallatin Valley to “reach out and care”! Thank you to Fred and Kari Haas, & Bruce and Jeanie Smith for your hard work and cheerful hearts. We couldn’t do it without you. For tickets be sure to visit www.rocwheels.org/mjr before they get sold out! Seats are limited. For those of you who may have missed our spring newsletter, we have now made it available here on our website. If you would like to receive these newsletter's by email, please use the form below to subscribe. We appreciate your support and commitment to ROC Wheels. Please click the image below to download the full newsletter. Here at ROC Wheels we are starting a new segment of our blog and social media where we share an inspiring story about someone in our community. In the weeks to come, we hope that these posts will inspire you to ROC the world and make a difference. Today's story is about Josh from Jackson, Wyoming, who was diagnosed with a staph infection about three years ago. Although he believed it would not slow him down, complications led to him losing most of his toes and eventually both of his legs. He has had an uphill battle and has had to endure countless struggles. Josh is our inspiring person of the week because he did not let these struggles define who he was and recently he just got to share his first dance with his mother, Judy (see video). lucky to share moments like this with my family and dear friends. Thank you Josh for inspiring us here at ROC Wheels and we wish you the best in the time to come. 100 ROCKIT Chairs for Argentina! The Rotary Foundation (TRF) recently submitted a successful global grant application entitled "Custom Fit Wheelchairs for Santa Rose Rotary Club. Over the past week, we received news that this distribution will be moving forward and is scheduled for late fall of 2015. Currently we are in the process of manufacturing these chairs and are excited to see how mobility will affect these children's lives. Please keep checking our website for more details about the distribution and please contact us to see how you can get involved or donate to support our mission here at ROC Wheels. To mobilize people with disabilities in developing countries and to foster partnerships through ministry, youth empowerment, wheelchair distributions, manufacturing opportunities, and educational development. Stay in touch! Fill out the information below to get copies of our digital newsletter and events.